The Fair opened The H.A.Y.L.O.F.T. (Helping All Youth Learn of Farming and Technology) last year, an 11,000-square-foot interactive, hands-on agricultural education exhibit where young guests can milk a cow, brush a lamb, pick oranges, gather eggs, compete in the pony races (on pony cycles), and even navigate their way through the hay maze on peddle tractors. The H.A.Y.L.O.F.T. was such a huge hit last year; the organizers have expanded the exhibit to include a farmer’s market, a garden, a pig pen, and a water conservation station. The James E. Strates Shows will once again operate more than 70 rides, games and shows, and unlimited ride armbands are the best way to enjoy all the Midway has to offer. Opening weekend is Kids Weekends, with ride specials for the littlest guests, and special appearances by: Max Power & Nitro, the nine-foot tall robot that is a walking, talking dance party that is accompanied by his monster truck Nitro; and Priscilla the Dinosaur, the life-size, like-like dino makes a return visit this year to meet and mingle with guests. Plus The Magik Cirques, makes its debut at the Osceola County Fair, a “magical, comical and amazical” variety show that is fun for the whole family. 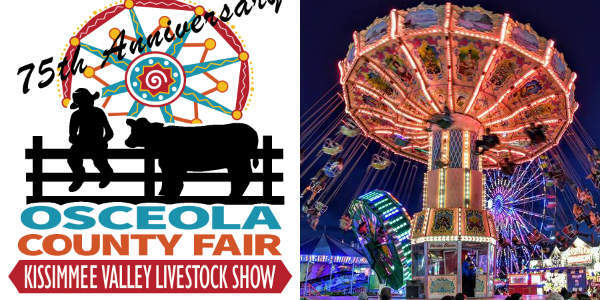 Visit osceolacountyfair.com for more information on daily entertainment, livestock shows, and so much more. FRIDAY, FEBRUARY 8TH – OPENING DAY! Armbands $25. Purchase ALL day, Ride ALL day! SATURDAY & SUNDAY, FEBRUARY 9TH AND 10TH – KIDS WEEKEND IS BACK! Special Child’s Armband $10, valid for 10 rides, for children up to but not including, 42″ in height. Valid on select rides only. CAN ONLY BE PURCHASED BETWEEN 12:00 p.m. – 2:00 p.m. each day. Valid only on day of purchase. Ride ALL day! Armbands $35. Purchase all day, Ride All day! $55 Per Carload. Limit of eight (8) persons. One (1) per seat-belt. Includes admission and unlimited rides until close. No carload tickets sold after 9:00 p.m.
*Must pay regular gate admission. Ride until close. Armbands valid only on day of purchase. *Second Rider MUST be present at the time of purchase. K-12 Students receive FREE ADMISSION to the fair. Unlimited Ride Armbands $25. Ride until close. K-12 Students receive FREE ADMISSION to the fair until 5:00 PM. Unlimited Ride Armbands $35. Purchase ALL day, Ride ALL day! Unlimited Ride Armbands $35. Purchase ALL day, Ride ALL day. $2 Off Adult Admission or $1 off Child or Senior Admission with non-perishable canned food item.